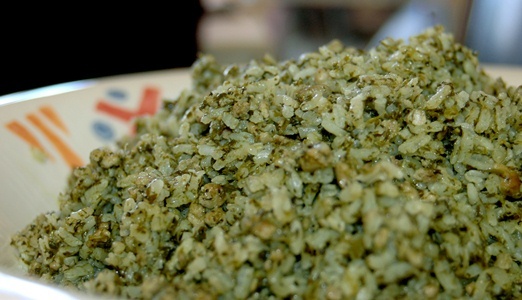 Bukhari green rice - "bachash"
“Bachash” is stirred Bukhari green rice (ie rice with herbs) and is considered one of the most favorite foods in Bukharan community. It is made in particularly large events. So the recipe is also here in large quantities (do not worry - there will not be any left once served...) Bukharian patriots make it with fine lamb and mutton fat, but you can also prepare it with other types of meat. Due to the fact that this is no small amount of work (not very complicated, but there is a lot of tinkering) - You can divide the recipe of preparation into two parts. The first part can be made in the morning, or the night before and kept in the refrigerator until ready for the second part. Meat - A pound of turkey or beef or mutton or lamb or chicken gizzard or a mixture of the above meats (every combination is possible). Grind the meat with a meat grinder or chop large holes with a mixer or manually. Note - Do not get to the texture of minced meat, it must remain textured blocks. If using turkey - do not remove the fat! (What you gonna do? - it's not healthy food - so eat it once every 3-4 months and more). Soak the rice in boiling water. After half an hour wash the rice well in a colander and leave to dry. Chop the spring onions small. Fry the beef with green onions and half a cup of oil. After the meat changes color, add a cup of water and a little salt and simmer for about half an hour. 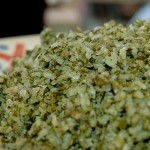 Add the meat into the chopped parsley and coriander, stir and cover everything with water. Bring to a boil, close the pot, and cook over a low heat for another half hour. Add the washed rice (if you prepare the meat ahead of time – you have to bring the pot to a boil before adding the rice). Add another half cup of oil or melted lamb fat. Add water to the height of the rice + one finger (approx. 1cm more than the rice). Bring to a boil and place on the lowest possible flame, close the pan and cook for about 20 minutes. Once the rice absorbs all the liquid - stir gently with a fork to open the rice. Wrap the lid and sides of the pan with a kitchen towel to save steam and cook on a low flame. Occasionally open the pot and stir gently with a fork. Left on the back burner (or the oven at 280 Fahrenheit, without a towel - but wrapped in aluminum foil) for 45-50 minutes. It is now ready. Bon Appetite! Usually at the bottom of the pot forms a type of roasted rice which is considered particularly tasty. Bukharians call it "tdigi" and it is traditionally served to the head of the family or the most important person attending dinner.